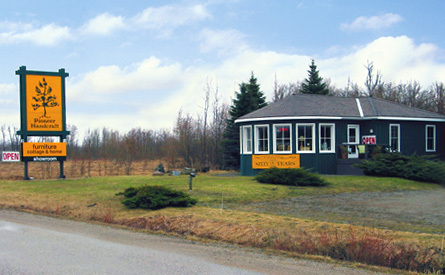 Pioneer Handcraft's main showroom and shop is located just north of Severn Bridge, Ontario, Canada. 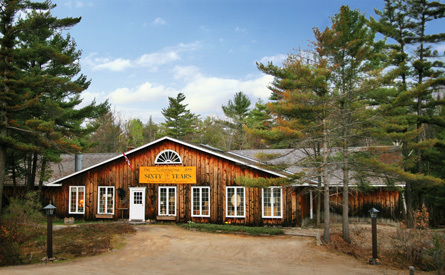 The recognizable showroom is on the south-bound side of highway #11, nestled amongst tall white pines and Canadian Shield granite. Open year round Monday to Friday 9:30 am - 5:30 pm, Saturday 9:30 am - 5:30 pm and Sundays 12:00 pm - 4:00 pm. Take Highway #400 north through Barrie to Highway #11. Continue north on #11 past Orillia for 15 minutes to Severn Bridge. 2 km north of Severn Bridge take the Sparrow Lake Route 'D' turnaround. Following #11 south for 2 minutes, look for the Pioneer yellow and green sign. Our Georgian Bay showroom is located on the east side of Highway #400 between Waubaushene and Port Severn, Ontario. Traveling north or south on Hwy. #400, take Quarry Road exit #149. The showroom is situated on the east service road ( Mayhew Road ) just north of Swift Canoe, just look for our yellow and green sign.